NIVEA Anti-Wrinkle Q10 Plus Replenishing Pearls is a serum that effectively reduces the appearance of wrinkles and smooths and softens the skin’s surface. The formula is enriched with Q10 pearls that burst upon application. the packaging makes dispensing easy, and I just rub it into my face. It doesn't smell strongly, and it's not overpowering. It has a bit of a weird texture, but the weird texture disappears after I rub it into my skin. the pump made dispensing easy, and when I woke up in the morning after my face would be really soft and moist and supple. It didn't really do much for my eye areas though. The Q10 Plus Anti-Wrinkle Replenishing Pearls by Nivea is an effective and thick serum. The product is packaged in a smooth cardboard box with yellow bubbles drawn into the background of the front of the packaging, the right-hand side of the box has a drawing of the bottle and how it works whilst the back and the left hand side has the product details written on it. The bottle you get out of the box is made out of a hard clear plastic and has a white lid which pops off to reveal a white plastic pump dispenser, the clear packing is great as you can see how much product you have left. The label on the bottle has the classic Nivea circle near the top of the front of the bottle and the labels background gradients from clear at the top to white to the bottom the middle of the bottle has the name of the product typed in yellow whilst the text near the base is in blue. The back of the label has a brief description of the product and how to use it. The serum itself as seen in the bottle is made up of defined yellow balls (which are the 'pearls') with a diameter of less than 5mm in a clear gel like solution. When you pump the product out of the top, the pump action breaks the pearls and the product which comes out of the pump looks a bit gross to me as it fragments of the balls within a clear gel like solution which has been deliberately broken by the bottles pump action. The product is a little thicker than I am used to for a serum but it spreads just as well as a more liquidly. I have been applying this product for over a month after using toner but before moisturiser and only at night. One pump is enough to cover my whole face and the Q10 Plus Serum has a pleasant Nivea like scent but with a hint of citrus? I found that the product was easy to spread and absorbed well into my skin and though it looks like the yellow bits might not rub in well they disappeared quickly. After use I found my skin feeling silkier and softer. I don't really have any deep wrinkles to get rid of so I cannot comment on that claim of the product but overall I really like this product and I would be more than happy to purchase it again. Don't be scared of the weird looking yellow chunks in gel which comes out of the pump. It breaks up/absorbes without any issues. I recieved an offer for this at priceline too good to refuse. I normally buy nutrimetics, and have for years, but as the price continued to go up, i thought i would try a budget one and get a little added bonus, for the price it was worth trying. I absolutely love it! I have super sensitive skin, prone to pimples and rashes and normally stay away from "supermarket" brands for this reason. It left my skin feeling silky, not sticky, and no ugly flareups. It doesnt last as long as my previous ones, but for the price, great value. This is my new FAVOURITE product in my skincare regime. You apply to a clean, cleansed face before your toner. One pump of the product is enough and it smells absolutely divine. It spreads across your face and neck smoothly and you can instantly feel your skin become moisturised. It doesn't leave an oily feeling but soaks into the skin quite quickly making applying your toner and moisturiser a breeze. Apply after cleansing and before toning. One pump is enough to cover your face and neck. The Ugly Ducking convinced me to egg my face! I remember reading The Ugly Duck's review on this product, and thinking "Wow, that is just the best, and funniest review I have read in a while". So when these little pearls were on special at my local Coles, I purchased them to give them a go. I'm kicking myself for not getting this earlier. The 40 ml hard plastic tube comes with a pump dispenser top, which squishes the pearls onto my fingertips, looking very much like 'just' scrambled eggs. I found I do have to gently massage the product into my face, making sure I check the mirror to make sure I don't have any yellow 'bits' stuck in my hair. I have been using this product for a good 4 - 5 weeks now, and I have noticed that my skin is smoother, and as I have replaced my previous serum with this product, I have noticed a great reduction in the redness of the skin around my nose and cheek area. I apply it to my skin straight after I've cleansed my face, so my skin doesn't have time to dry out. My skin feels soft and silky for hours and hours after using this product. Followed by my favourite day or night cream. My forehead creases are visibly reduced as well. It has the 'signature' Nivea scent, which I have always disliked, but the product works beautifully on my sensitive skin, so I'll definitely purchase it again. The only thing that concerns me (other than the scent... but I can deal with that), is that I have noticed my foundation doesn't go on as smoothly. I'm still testing that, but I haven't changed anything else in my skincare routine. The Nivea products go on sale regularly at supermarkets. Keep an eye out for sales. Apply a little to your fingertips to gently massage all over your face. Those with sensitive skin. Follow by your favourite moisturiser. I recently won a sample 40ml bottle of these beautiful serum pearls. I absolutely adore them, now I'm in my 40's this is a perfect product for me. It feels so deliciously smooth on my skin and being yellow it's such a happy little cream and makes me and my face very happy with the results and feelings I'm getting. It only took a few days for me to notice the difference. I put it on as soon as I get out the shower and then about 10 mins later I put the Nivea day cream over it, its all I need to get me set for the day. The Nivea Q10 plus anti wrinkle serum pearls comes in a 40ml clear pump bottle with a white lid. You can see the yellow pearls of serum through the clear bottle. This is very clever how they have shown the yellow pearls of serum in the bottle. The instructions ask you to apply on a cleansed face before applying day or night cream. When you press the pump the little yellow pearls burst out into a yellow creamy texture. You only need a small amount of serum. The serum doesn't leave an oily reside behind. The serum feels beauiful & fresh on your skin. It's very easy to apply your day & night cream after. I find this product very good on dry skin. It hydrates my skin & makes it feel fresh & alive. I haven't used it long enough to say if it works on my wrinkles but time will tell. I was delighted to discover the Nivea Q10plus Anti-wrinkle Serum Pearls product recently. The lightweight container, size and look appealed to me, especially for travelling. Another drawcard were the nourishing Q10 vitamin and Hyaluronic Acid ingredients. This serum is super effective for skins like mine that are feeling the effects of aging as the creamy pearls that are dispensed upon application are so soft they simply melt into your skin. My skin has felt amazingly smooth and yes, I could even say has reduced some fine lines, and made my complexion feel much younger (just wish it could do something for dark circles). As it is a serum you need to apply it prior to your moisturiser, either day or night, and only a small amount is needed. It truly absorbs beautifully into your skin. This serum is lovely to use. It leaves my skin smooth, soft and plump which is obviously great. Over the past month or so of using it, I have noticed an improvement in the appearance of my fine lines and I think it's due to the fact that this product keeps my skin so plump. It dispenses a funny looking yellow cream that smooths nicely into my skin. It soaks in immediately and leaves my skin with a smooth, matte appearance. When using it under makeup, I find my makeup lasts longer and applies more smoothly and evenly. I don't love the strong scent and it can irritate my sinuses but thankfully it does fade. I received a sample size of this product in a subscription sample box and purchased a full size after a few uses of the sample. My skin appeared smoother, plumper, brighter and more even after a few uses and I have had no problems with it clogging my pores or being too heavy for my younger skin. The pump dispenses the perfect amount for one application and the visible beads in the tube are broken apart as it is dispensed. Allow it to penetrate for a few minutes before applying your moisturiser. Younger skin looking for an anti aging boost before the damage is done. Happy from the first use! I purchased this product in a rush as I had just ran out of my normal serum and I was pleasantly surprised. The consistency when you first pump it out is like curdled custard, but it melts and glides on to the skin beautifully. There is no oily residue left behind and it left my skin looking brighter and smoother from the first application. I now use it morning and night. It works well under makeup and does not create pilling when combined with my primers or foundations like other products I have tried.  I love this product and have recommended to so many family and friends. Nivea, you had me at "Serum Pearls"
I picked this up from Coles on special and was thrilled. I love the pretty and happy yellow packaging of this product. The Nivea Q10 plus Anti-Wrinkle Serum Pearls is 40ml of product which comes in a cardboard box which actually sits inside a cardboard sleeve. I didn't notice this, so the inside box actually slid out of the sleeve and the cardboard box slid along on the Coles floor and I chased after it! The serum is encased in a beautiful clear and white capped hard plastic pump bottle. It looks clean and fresh. The bottle itself is transparent, so I can see the cute little yellow serum pearls inside, waiting to come and nourish my skin. To use, just flip off the white lid, press the pump, and the pearls will magically burst and come out in a white and yellow squished cream blob. The serum itself is medium thickness and because I've just released the pearls now, some of the serum can be thick and some of it is clear and slightly runny. This doesn't matter, because it still spreads well onto my skin. When I apply it, it is slightly thick and is absorbed quickly. I use 2 pumps for my big face, neck and décolletage. The fragrance is like a sweet perfume, some users may not like it. I actually like the scent and have noticed that it disappears on me after a few minutes. It seems like a fresh, slightly lemon, citrus scent and I like it, but ofcourse this is personal choice. This serum absorbs into my skin like a moisturiser, because most serums for me have been more watery compared to this one. Once I apply the serum, my skin feels soft and nourished. Then I apply my night cream as my next step. Use in the morning or night before you apply your regular moisturiser. It is well priced, but look out for specials at the shops and at the grocery store too! This serum contains Q10, which is supposed to help visibly reduce deep wrinkles and the formation of new wrinkles. That's a big claim, I'm not convinced about that yet, as I've only been using it for a few weeks now. Personally, I wish we could actually see the release/squishing of the pearls in the pump, that would be a bit amazing to watch. The picture in the side of the outer sleeve shows you the serum pearls and the how they will be released. I love trying products for their novelty factor, I mean, little yellow serum pearls, very unique and cute. Beyond that, I found that this works well as a base to start off my nightly skincare routine. It kept my skin feeling nourished. Overall, I love the price, and cuteness aspect of this product. Repurchase? Yes, I enjoy using it, price is low and it keeps my skin soft. I was on the trial team for this product and because of time constraint I only had 10 days to trial the product to write the previous review. Since I was part of the trial team I felt that I have a duty to update my review now that I am finishing up the whole bottle (lasted approximately 6 weeks). At the time of the official trial period I followed the instruction and use an oil-free moisturiser on top of the serum. After the trial period, in AM I used an SPF cream on top of the serum, and at night I use the pearls alone as I feel that this serum is thicker than normal serum and I get enough hydration by using this product alone. I do not have any further observation contrary to my previous review - I think that it is a very nice serum that keeps skin hydrated and silky to touch. I have very much enjoyed using this serum especially at its price point (RRP $29.90, but often discounted to $21 in chemist warehouse or priceline). I did eventually get used to the scent which I found to be too strong and artificial during the official period. However, after 6 weeks of continuous use I do not visibly observe any reversal of my wrinkles and lines that are already there. It has certainly kept my skin plumped and hydrated while the product is on my skin and so I would classify it as a prevention product rather than repairing product. I received a decent size sample of this a couple of weeks ago and have been using it in my nighttime routine. The little yellow balls that burst on their way out are a clever little invention, supposedly "activating" as you pump them out. So visually its very appealing. After using it consistently for the past few weeks I can definitely see an improvement in the texture and suppleness of my skin (especially around my eyes). At 24 I don't exactly have wrinkles but i do have a couple of fine lines. I haven't really seen any improvement in those. Consistency is the key i feel with this product, and starting early, better to prevent wrinkles than try and fix them later on i imagine. Skin feeling supple and well hydrated! I have been hearing good things about coenzyme Q10 and I was very excited to give this serum from Nivea a go. The pearls looked very funky and different to anything I have tried before, plus my mother has always been a fan of Nivea products, so I was sold. I like the packaging on this one quite a lot - the pump bottle makes for easy dispensing and keeps the bacteria out. I also like the idea of the pearls 'popping' just as you press the pump, so that the serum is freshly squeezed so to speak. The serum is easily absorbed into the skin and you don't need much to cover your whole face. It leaves my skin feeling very hydrated and soft. Leaves skin soft, smooth and hydrated. 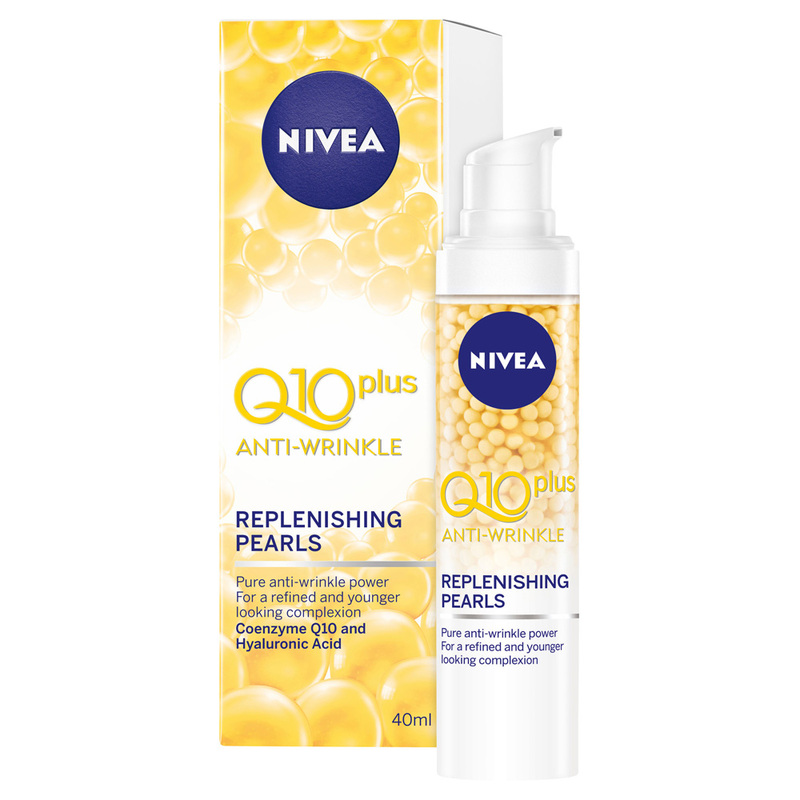 The Nivea Q10 plus anti-wrinkle replenishing pearls comes in a nifty little pump bottle which is great for controlling the amount of product you use. The golden yellow pearls sit in a clear gel and are visible in the bottle which means you can keep an eye on how much product you have left. The little pearls burst once the pump is dispensed. I used this on my face and neck both morning and night after first cleansing my skin. The first time I used it I was surprised by the look of the product when dispensed as it has a curdled milk look about it. The product, however, feels really light and is quickly absorbed on application leaving my skin feeling soft, smooth and super hydrated. I am not really a fan of the scent of the product, though once absorbed and I applied moisturiser, the scent was no longer obvious. Apply after cleansing your skin. Those looking for a hydrating serum that helps soften and smooth skin. Makes your skin more glowing. Thank you to BH for allowing me to trial this product. Like any serum, it should be used after thoroughly cleansing your face, and applying a toner. I don't have much wrinkles, but it definitely made my face look much brighter. Unfortunately, serum is not meant to be applied unto the skin around your eyes, so those areas were much darker. The pump was easy enough to use, and two to three squirts should be enough to apply around the face and neck area. The cream looks eggy and yellow. But it doesn't appear eggy after application. Clean your face before applying. Skin that wants to appear more fairer. I received the Nivea Serum Pearls as part of a trial. I wouldn't usually buy this brand to use on my "maturing" face, although I love their body products, so was slightly sceptical. The serum was very nicely packaged in a box, which also had a sleeve around it with additional information. The bottle itself is a clear plastic with the pearls visible. The pearls are gold in colour, suspended in a clear gel. Visually, they are very impressive. The bottle has a pump dispenser. When dispensed, the serum has an appearance of a scrambled egg. It's quite chunky and thick. When applied onto the skin however, it completely disappears within a couple of rubs. It has a very strong floral/citrus scent. I liked it at first but it got a little overpowering with each application. I couldn't find any information on the box about ingredients, and what was used to perfume it. The serum absorbed very nicely into the skin, leaving it immediately hydrated but not wet or oily. It is very light and easily paired with a moisturiser. It didn't cause me to become oily during the day and didn't interfere with my makeup/foundation. In fact, it started to get rid of my dry patches where my foundation would previously cling to. After just a few days I noticed the skin on my cheeks to actually look "younger". It looked more plump, hydrated and rejuvenated. I didn't notice a great difference to the deeper lines. I was amazed how good this product felt on the skin and how great it was at managing early stages of ageing. I wouldn't say it reversed signs of ageing, but definitely made a significant difference to the overall appearance of tired skin. I would 100% recommend it for that. I don't think I've tried any other product with such fast result. Prevention of early signs of ageing. Start using it before deep lines appear to plump and hydrate tired looking skin. I was lucky enough to trial the Nivea Q10 Plus Anti-Wrinkle Replenishing Pearls through Beautyheaven. I really liked this product, it is a great serum to prepare the skin prior to applying moisturiser. I used it morning and night and enjoyed the feeling of smoothness and hydration it provided. The little balls are super cool, they pop as you pump the product out of it's tube and glide on effortlessly. The only downside for me was that I really didn't see any difference in my skin. It felt lovely when I applied it, but there were no visible effects that I could notice. However it has a nice price and I will continue to use the tube I have in the hopes that maybe in the future I will see a difference. The only time I want egg on my face! With its pioneering technology the new Q10 plus Anti-Wrinkle Replenishing Pearls will pamper your skin with ready to burst Q10 pearls. Within the NIVEA Q10 plus Anti-Wrinkle range the unique Replenishing Pearls deliver the highest dosage of skin's own coenzyme Q10 in a silky smooth serum. Its highly powerful formula enriched with Hyaluronic Acid proves its pure anti-wrinkle power by not only helping to visibly reduce the appearance of wrinkles but also helping to prevent the formation of new ones. With regular use, the innovative Q10 plus Anti-Wrinkle Replenishing Pearls noticeably soften skin's surface for a smoother, younger looking complexion. Skin is the largest organ of our body. Q10 and Creatine are powerful actives naturally found in young skin. With age, their levels decrease, leaving the skin with less energy to regenerate. Over time it is more prone to wrinkles and other signs of ageing. So I’ve not really been a person to punch my ticket and board the Nivea skincare range [shakes head]. I can’t even tell you why, it’s so silly. Their branding and advertising is on point. From what I recall of previous experiences, their body care range is good if not great, so what’s holding me back? Shrug. No good answer. For shame. This Beautyheaven trial presented itself as a grand opportunity to take that shrug and turn it into a potential product hug (or thug). The box was very clever. I was mightily impressed with the packaging. The box is captured within a cardboard sleeve, which I personally find a great way to present a new product to the market (particularly when on the side it shows, and I quote a “visual of product in actual size”), showing the pearls within the dispenser and how it is pumped out graphically. Very clever, Nivea. I appreciate you. The sleeve pulls off to reveal the standard product packaging. The two (packages) together provide a comprehensive description of what this serum does. The actual serum is a plastic vacuum-style pump. The container is clear with a fade-out branded label over the top. The cap is a pop-off style to reveal the pump (for those who appreciate their hygiene, you will like this dispenser). Nivea: top marks for packaging! For the purposes of this trial, I’ve been using this product morning and evening prior to applying facial oil and a skin moisturiser. From a curiosity perspective, you see little yellow pearls suspended in a clear gel-like substance that are to expel through the pump into your hand. What hits me first is what it looks like on my fingers when I first depress the pump. Wowzers. An appropriate analogy would be to say the product looked like coddled or very loose scrambled eggs in my hand. I even took photos. The wee pearls get ‘squished’ a bit as they are dispensed (to be expected) but to see the end result was still surprising. I was kind of hoping I got to do the squishing on my face! Oh, and the fragrance isn’t a turn on. Tee hee! The serum does look very yellow and eggy, however the texture smooths out easily. It feels extremely silky on the skin and the absorption is unlike anything else. I’ve used quite a few serums over the past twelve months in the pursuit of finding the right one. What impressed me about this particular serum is that it doesn’t feel tacky or sticky on the skin. Rather, this serum feels like a layer of additional preventative protection that sinks right in and becomes a part of your skin routine. There’s the added bonus where this serum can also be used all over the face. I have been using this serum consistently twice daily for the past two weeks and it has been the extra moisture boost I’ve needed at this time of year. I have combination to dry skin, I’m about to turn 38 and fine lines are absolutely a concern of mine. As I have been increasing the topical vitamin C on my skin, this in turn affects the dryness of my skin. The Nivea Q10 Plus serum has been the perfect foil. My skin is actually more plump. Get into it! Apply to freshly cleansed skin. I have been using a vitamin c treatment on my skin so I’ve been applying this serum after the treatment and it’s worked extremely well with no reactions whatsoever. I also found this serum to be incredibly gentle, enough so that I was content to use it all over my face, including my eyes. I suffered no reactions there either. I was very happy. I think this serum is an excellent all-rounder with a reasonable price point for those with combination to dry skin or ageing skin concerns. If you aren’t keen on heavily scented products (which I am typically not a fan), this might be one you want to avoid or try a stash of someone else’s first before investing. It is, however an excellent product where your day / night cream will cover the scent of this serum. I am very impressed by this eggy concoction. Enough so that I think I might continue using this serum. It has far surpassed my expectations, scent and visuals aside! Did our members rate this serum?